Sometimes your life gets so hectic, all you can do is throw your head back and have a good laugh! 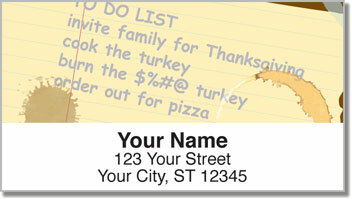 That's what inspired this silly set of return address labels! They poke fun at how frustrated we get over the little things that bog us down. But these labels also remind us that those lists of chores and responsibilities are trivial in the big picture. 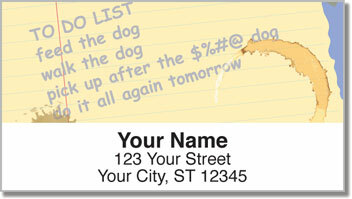 To Do List Address Labels are an exclusive CheckAdvantage design that let show off your unique sense of humor on every letter and package you send. Plus, they'll make it a lot easier to prepare your outgoing mail. The handy self-adhesive backing lets you save time and headaches. 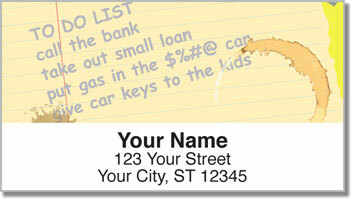 No more scribbling out your name and address by hand! That's just one less thing you have to worry about. 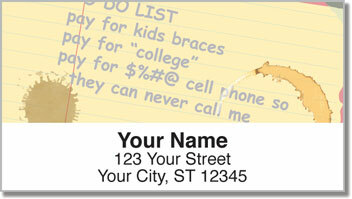 Get your very own To Do List Address Labels today! Don't forget to check out the matching personal check design as well!